Lists, rankings and ratings eliminate some of the guesswork in life. For example, instead of chancing a bad experience, I check rating websites for a restaurant, a movie or even a church. Goodreads and other online forums allow readers to post comments and ratings about novels or collections of stories. How would the general population rank Chekhov’s short stories? The half-dozen books on my desk about Chekhov or Chekhov’s anthologies are the old way of researching. I need guidance on where to begin, what is considered the best of Chekhov and how to do all of this in the quickest amount of time. 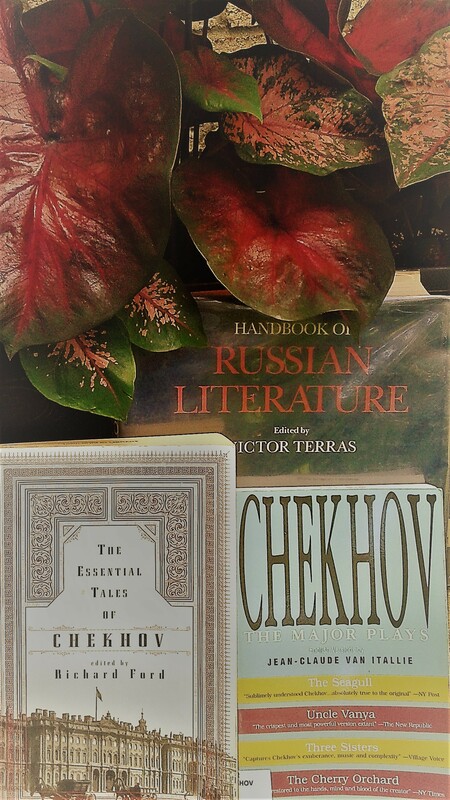 Books like The Essential Tales of Chekhov edited by Richard Ford offer a method for reading the best of Checkhov. Ford, a temporary Michigan transplant from the South, attended Michigan State University and writes in his introduction to the Chekhov anthology that Chekhov is a writer for adults. Chekhov’s most frequent themes of adultery, poverty and illness are not exactly the hero’s journey that Hollywood pumps into most movies. Chekhov’s plots pale and blur while his characters are noteworthy. My Russian dentist who inspired this literary trek says Chekhov descriptions, such as in “A Man with a Case,” have become Russian cultural references for describing personality types. After reading every Chekhov story, Richard Ford chose his favorites. He admits to adding a few stories that were not as polished and complete as Chekhov’s later works. In Ford’s opinion, “The Lady and the Dog” is one of Chekhov’s finest short stories. If narrowing the reading to a handful of stories is still too much, then do what theme parks call the “fast pass.” Similar to a theme park’s shorter line, this method makes the classics very easy, fast and fun. I can listen to more stories than I have time to read. Both professional and school productions of Chekhov’s stories are found on YouTube. Fans of silent movies will want to watch the short 2012 adaptation of Death of a Government Clerk by Ethan Unklesbay. Audio recordings are also on YouTube including the free online digital libraries of Librivox.org, read by volunteers. “Misery” is a good recording. In conclusion, Chekhov’s short stories are for the reader to experience many times and in many ways. Ranker.com and Richard Ford helped begin my journey, but there are many stories remaining for me to enjoy. Each different story makes me fall a little bit more for the #3 Hottest Dead Writer. So what is your ranking? Which Chekhov story is your favorite? Love your honesty that you spent more reading the rankings than reading Chekhov! Greg, Thanks for your comment. My favorite is “The Seagull.” See the next post about the play. Great post! Thank for researching and providing us with so many ways to get started and enjoy Chekhov’s (and other great’s) writings. This is very interesting Karen. I never realized all these websites existed or it was possible to do this. I found your article fascinating and learned a number of things. Nice post. I always appreciate the guidance of a list, you can’t read everything, hard enough to read a few things, then your reading rate has to outpace the rate of forgetting what you read. BTW, what were Chekhov’s 69th ranked dying words?